Corresponding authors. E-mail addresses: zhangkan@ujs.edu.cn, zhangkan0821@163.com (K. Zhang), maiyongzhu@ujs.edu.cn (M. Zhu). 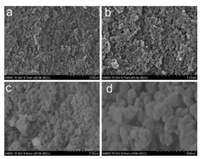 Abstract: In this article, novel silver nanoparticles immobilized on macroporous polybenzoxazine nanocomposites (Ag-poly(BA-ddm)mainx) were prepared as catalysts for catalytic reduction reaction. For this purpose, a main-chain type benzoxazine was cured in dimethyl sulfoxide by thermally activated ring-opening polymerization at 180℃ for 2 days followed by the reduction of silver nitrate in homogeneous polybenzoxazine solution. The porous structure of the resin was confirmed by scanning electron microscope (SEM) analysis and N2 adsorption/desorption studies. 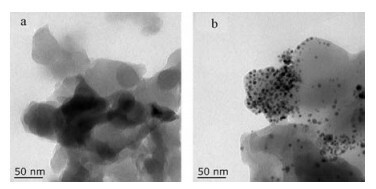 Besides, transmission electron microscopy images showed that spherical particles (around 3-10 nm in sized) are dispersed in Ag-poly (BA-ddm)mainx network. The catalytic activity of the as-prepared nanocomposite has been investigated by photometrically monitoring the reduction of methylene blue by an excess of NaBH4. The kinetic data of the reduction reaction was explained by the assumption of a pseudo-first-order reaction with regard to methylene blue (MB). As evidence by Ultraviolet (UV) spectral analysis, the Ag-poly(BA-ddm)mainx catalyst possesses excellent catalytic reduction of MB, and no deactivation or poisoning of the catalyst was observed. The results demonstrate that porous polybenzoxazine supported silver nanoparticles can be applied as reusable catalysts with satisfied catalytic activity. Noble metal nanoparticles (such as Pt, Ag, Au and Pd) have been extensively studied because of their potential applications in the fields of catalysis, fuel cells, sensors, optical devices and biomedicine [1-6]. In General, nanoparticles in nanoscales are typically able to perform highly active centers that are closely resulting their superior catalytic activities [7, 8]. However, the high surface energy of nanoparticle bring the problem of aggregation, remarkably decreasing their surface area . One impactful method for developing catalysts with highly dispersion at certain small particle size is to immobilize metal nanoparticles on solid support with high surface area, high chemical stability, good thermal stability, as well as preventing the aggregation of nanoparticles and indefinitely maintaining the catalytic performances . In spite of the enhanced useful performances at a nanoscale level, when nanoparticles are immobilized onto a support matrix, they possess unique excellent physical properties originated from quantum size effects . Various materials have been demonstrated as suitable candidates for noble metal catalyst supports, such as mesoporous silica, carbon-based materials (graphene, reduced graphene oxide, carbon nanotubes, carbon nanofibers and mesoporous carbon), polymers, metal oxides, etc. [12-18]. Nanocomposites with metal nanoparticles embedded in a polymeric network are highly promising for a number of industrial applications because of the synergistic properties of their constituents. The synthesis strategy of metal nanoparticles is generally carried out by the reduction reaction from metal ions, which is stabilized in polymeric network through complexation. In this way the polymer supports efficiently prevent the aggregation of nanoparticles and serve as carriers. Ordinarily, polymers bear nitrogen-, oxygen- and sulfur-containing functionalities as complexing sites for metal ions are effective for nanoparticle supports . Polybenzoxazine is a recent developed high-performance material that has been attracting substantial attention due to its outstanding properties, such as high thermal stability, high modulus, resistance against flame, chemical resistance, low water absorption and very limited volumetric change upon thermally activated polymerization [20-27]. Polybenzoxazines are in general produced via cationic ring-opening polymerization by heating benzoxazine monomers or other polymeric precursors containing benzoxazine moieties with or without added initiators and/or catalysts. There has been much work on designing new benzoxazine structures to further explore their potential applications by considering advantages of molecular design flexibility. The most features of benzoxazine resins are mainly due to the Mannich-base bridges (–CH2-N(R)-CH2-) and the inter- or intra-molecular hydrogen-bonds among nitrogen and phenolic OH groups. The existence of phenolic O and N atoms in polybenzoxazine networks leads the possibility to bind mercury salts . From this point of view, polybenzoxazine, which contains both N and O atoms, is a potential alternative for metal nanocatalyst supports though the coordination between metal ions and O and N atoms. In this article, we report a simple strategy to prepare novel nanocomposites (Ag-poly(BA-ddm)main) with highly dispersed silver nanoparticles supported in porous polybenzoxazine. The surface area of polybenzoxazine has been obviously increased via performing the thermally activated polymerization in a solvent with high temperature of boiling point. Furthermore, the reduction of methylene blue (MB) with NaBH4 was studied to evaluate the catalytic activity of Ag-poly(BA-ddm)main. Initially, the main-chain type benzoxazine was synthesized by reacting bisphenol-A, 4, 4'-diaminodipheylmethane (ddm) and paraformaldehyde as shown in Scheme 1. The product was abbreviated to be poly(BA-ddm)main from the abbreviations of the starting materials. The molecular weight of poly(BA-ddm)main was evaluated by GPC. Poly(BA-ddm)main shows the number average molecular weight (Mn) of 8604 with a high polydispersity index (PDI) equals to 3.36. The GPC results indicate that the molecular weight of the main-chain benzoxazine directly synthesized from Mannich condensation is not so high. However, the low molecular weight as well as the high PDI of this polybenzoxazine precursor could result generating more phenolic hydroxyl groups in the chain-end functionalities, which has been determined as a powerful catalyst for decreasing the ring-opening temperature of benzoxazine ring . 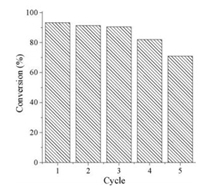 The lower polymerization temperature is highly desired in this study since the polymerization process along with the porous generation was conducted in DMSO. The structures of poly(BA-ddm)main were examined by 1H NMR and FT-IR spectroscopy. Fig. S1 in Supporting information shows the 1H NMR spectrum of poly(BA-ddm)main. The characteristic chemical resonances for methylenes of O-CH2-N- and Ar-CH2-N in oxazine ring are observed at 5.28 and 4.52 ppm, respectively. The methyl proton from bisphenol-A and the methylene proton of ddm are located at 1.56 and 3.78 ppm, respectively. FT-IR was also used to further confirm the structure of poly(BA-ddm)main. In Fig. S2 in Supporting information, the presence of the benzoxazine ring aromatic ether in poly(BA-ddm)main is indicated by the band at 1229 cm-1, which is assigned to the C–O–C asymmetric stretching [30, 31]. Besides, the characteristic benzoxazine related mode is centered at 932 cm-1. 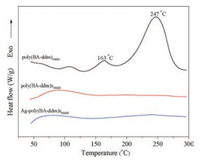 In the subsequent step, Ag-poly(BA-ddm)mainx was prepared by polymerization of poly(BA-ddm)main with AgNO3 in DMSO at 180 ℃ for two days, later by reduction of the silver ion via NaBH4 to form the silver nanoparticles immobilized on porous polybenzoxazine nanocomposites (Scheme 2). During the polymerization, both O and N atoms from the free phenolic hydroxyl group and an adjacent tertiary amino group in polybenzoxazine result a coordination system with silver ion. 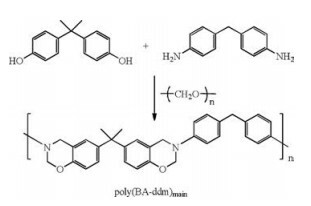 In addition, the polymerization of the pristine poly(BA-ddm)main was also performed to form a porous resin (poly(BA-ddm)mainx) for comparision. Fig. S2 also depicts some of highlighted infrared bands, which can be used to verify the ring-opening reaction of benzoxazine ring. The characteristic absorption bands at 1229 cm-1 (C–O–C asymmetric stretching modes) and 932 cm-1 (benzoxazine related mode) disappear in both poly(BA-ddm)mainx and Ag-poly(BA-ddm)mainx, suggesting the completion of ring-opening polymerization of oxazine after heating in DMSO. The completion of polymerization of poly(BA-ddm)main was also monitored by DSC. It is known that benzoxazine resins can undergo a thermally activated ring-opening polymerization, which is able to be detected by DSC due to the ring-opening of oxazine ring is an exothermic behavior. Fig. 1 shows the thermographs of poly(BA-ddm)main, poly(BA-ddm)mainx and Ag-poly(BA-ddm)mainx. Different from the traditional benzoxazine monomers, the DSC thermogram of poly(BA-ddm)main exhibits multiple thermal events in the form of several exotherms. These three exothermic peaks were observed with the maxima around at 110, 163 and 247 ℃, attributing to the reaction between the chain-ends and the end groups along with the ring-opening polymerization at higher temperature [32, 33]. The second exothermic peak, which is caused by the ring-opening polymerization of oxazine ring promoted by the phenolic chain end groups, clearly suggesting the possibility of the polymerization of poly(BA-ddm)main in DMSO at a lower temperature. Furthermore, both poly(BA-ddm)mainx and Ag-poly (BA-ddm)mainx did not show any exothermic peak, indicating the completion the consumption of benzoxazine rings after the designed thermal treating process. In general, benzoxazine resin can undergo a thermally activated ring-opening polymerization without any solvent to form polybenzoxazine. However, the specific surface area of the polybenzoxazine generated from solvent free polymec ring-opening polymerization by heating benzoxazine monomers or other polymeric precursors containinrization is generally not more than 1 m2/g . Polybenzoxazines with such low porosity is unfit to applied as metal nanocatalyst supports. In this study, poly(BA-ddm)main was thermally treated via polymerization in DMSO at 180 ℃ for two days to form porous polybenzoxazine resin. Also the Ag nanoparticles supported in porous polybenzoxazine was obtained by the reduction of silver ion from the coordination network in polybenzoxazine. The SEM images of obtained porous materials are shown in Fig. 2. Both poly(BA-ddm)mainx and Ag-poly(BA-ddm)mainx exhibit an open, loose cotton-like network structure, and they are composed of many irregular microparticles of about several tens to several hundreds nanometers in diameter. 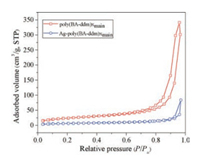 The porosity parameters of poly(BA-ddm)mainx and Ag-poly(BA-ddm)mainx were analysed by physical adsorption/desorption of nitrogen at 77 K (Fig. 3). Poly(BA-ddm)mainx exhibited porosity with a BET surface area of about 86 mg2/g, which is much higher than that of porous polybenzoxazine derived from benzoxazine monomer . In addition, a relative lower BET surface area (24 mg2/g) was obtained for Ag-poly(BA-ddm)mainx. 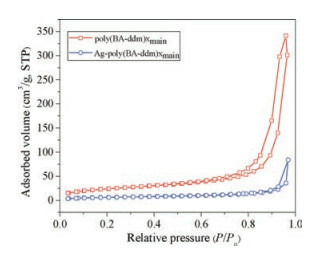 This result indicates the silver particles can be immobilized on the channels of polybenzoxazine network, leading Ag-poly(BA-ddm)mainx with a lower surface area compared with poly(BA-ddm)mainx. Furthermore, it is seen that a large and steeper increase in the P/P0 after 0.8 which is attributed to the macroporous/nanoparticulate adsorption. Therefore, both materials should consist of macroporous structures. The loose packing of small size particles contribute to increase the interparticulate voids as reflected in the significant increase of nitrogen uptake when the P/P0 values exceeds 0.8. However, the porous polymeric materials usually show adsorption-desorption hysteresis due to the softness of flexible segments and deformation of pore structures during the measurements in liquid nitrogen [34-36]. Interestingly, both porous materials exhibit well reversible adsorption-desorption isotherms, indicating the network architectures constructed from porous polybenzoxazine are sufficiently rigid. TEM was further performed to analyze the microstructure of the silver nanoparticles immobilized on porous polybenzoxazine nanocomposite. As shown in Fig. 4, the dark spherical particles, which are observed as around 3–10 nm in size, are dispersed in Ag-poly(BA-ddm)mainx network, while no dark particles can be observed for poly(BA-ddm)mainx. These dark particles are attributed to silver nanoparticles due to its high electron density. The networks of Ag-poly(BA-ddm)mainx are very neat, and no large aggregates of silver particles are taken place. The TEM result indicates that the coordination system, binding of silver ion to phenolic hydroxyl and tertiary amino groups, plays a very important role in the prevention of aggregation from silver nanoparticles. The surface composition and oxidation state of Ag-poly(BA-ddm)mainx were investigated by XPS as shown in Fig. 5. In Fig. 5a, the signal of silver is much weaker than the other elements of carbon, oxygen and nitrogen on the surface of Ag-poly(BA-ddm)mainx. This phenomenon is possible due to the most Ag nanoparticles are immobilized onto the channels rather than the surface of Ag-poly(BA-ddm)mainx. Additionally, Fig. 5b depicts the XPS spectra of Ag3d. The signals located at 368.38 and 374.30 eV are attributed to the characteristic peaks of Ag3d5/2 and Ag3d3/2, respectively. The Ag3d XPS results indicates that no obvious shift is taken place for the Ag of Ag-poly(BA-ddm)mainx compared to bulk Ag (Ag3d5/2: 368.3 eV, Ag3d3/2: 374.3 eV), clearly determining that the Ag in Ag-poly(BA-ddm)mainx exists as the form of Ag(0) . The previous reports have been demonstrated that metallic silver nanoparticles are performed as superior catalysts with high activity and selectivity . Besides, silver nanoparticles are possible used as recyclable nanocatalysts while immobilized on a solid support. Herein, the reduction of MB by NaBH4 was conducted as a model reaction to evaluate the catalytic performance of Ag-poly(BA-ddm)mainx. The reason for choosing the reaction of MB with NaBH4 is its convenient monitoring via UV–vis absorption spectroscopy without additional reactions. Fig. 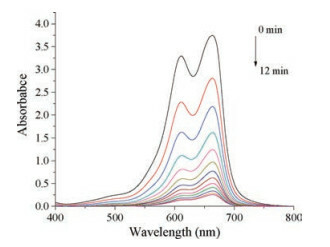 6 shows the successive UV–vis spectra of MB in the presence of NaBH4 and Ag-poly(BA-ddm)mainx in aqueous solution at 25 ℃. The spectra of the measurements were obtained at 1 min intervals. Ordinarily, the reduced reaction usually consists of the following processes: firstly, NaBH4 was adsorbed onto the surface of nanoparticles to generate metal hydride, and afterward MB adsorbed onto the surface of nanoparticles; at last, MB was reduced and followed by desorbed to generate a free volume for continuous of the catalytic reduction. As shown in Fig. 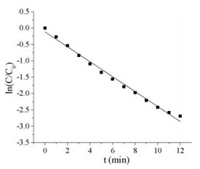 6, the absorption intensity at λmax of MB significantly decreases along with the reaction time, suggesting the existence of the reduction for MB. On the other hand, the catalytic reduction of MB carries out successfully, and no poisoning or deactivation was observed during the measurements. The results indicate that the MB reduction follows the pseudo first-order kinetics with respect to the concentration of MB in solution. In addition, Fig. 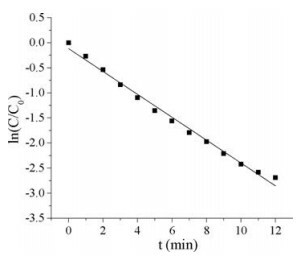 7 displays the linear relationship of In(Ct/C0) versus the reduction time. Therefore, the catalyzed reaction rate of MB reduction in the existence of Ag-poly(BA-ddm)mainx as catalyst can be estimated to be 0.23 at 25 ℃. 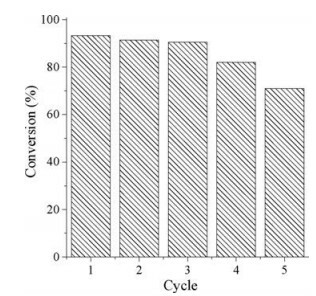 The temperature-dependent rate constant of this catalytic reduction for MB was also studied at 20, 25, 30, 35, and 40 ℃, respectively. As shown in Fig. 8, the corresponding apparent rate constants were evaluated. 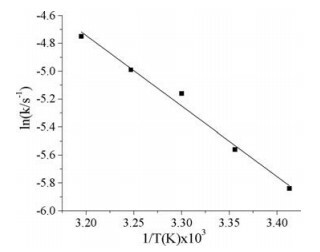 It is can be observed that the value of kapp gradually increases with the increasing of temperature, clearly indicating that the rate of reduction reaction is enhanced by increasing temperature. Furthermore, the activation energy of MB reduction reaction by Ag-poly(BA-ddm)mainx was calculated to be 42.02 kJ/mol according to the Arrhenius equation. Considering the cost of catalytic materials and the arising problem of environments, the renewable catalytic activity of catalysts is highly desired nowadays. Therefore, the recyclability of Ag-poly(BA-ddm)mainx as the catalyst for the reduction of MB was also investigated in this study. As shown in Fig. 9, Ag-poly(BA-ddm)mainx can be recycled and reused for three times without significant decrease in the reduction of MB. After the reusability test of three times, the degradation is most probably due to the soft chain rearrangement of polybenzoxazine, causing pore collapse and structural changes of Ag-poly(BA-ddm)mainx. The catalytic test study suggests the porous polybenzoxazine supported silver nanoparticles can be applied as reusable catalysts with satisfied catalytic activity. Novel silver nanoparticles immobilized on macroporous polybenzoxazine nanocomposites (Ag-poly(BA-ddm)mainx) have been designed and smart synthesized via a main-chain type benzoxazine. 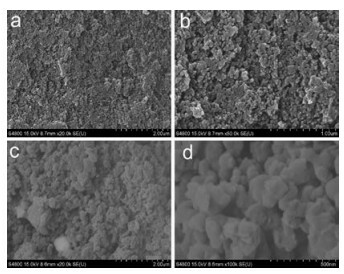 The as-prepared nanocomposite can be applied as catalysts for the reduction of MB with NaBH4. In addition to the unique advantages of easy synthesis, low-cost, and reusable properties of Ag-poly(BA-ddm)mainx, this study also suggests a new potential application in catalytic area for benzoxazine resins, further indicating the excellent molecular design flexibility to tailor the desired properties of this attractive polymeric material. The authors express their gratitude to the National Natural Science Foundation of China (NSFC) for their financial support Nos. 51603093 and 21403091). This project is also supported by the Science and Technology Agency of Jiangsu Province (No. BK 20160515) and China Postdoctoral Science Foundation (No. 2016M600369). N. Tian, Z.Y. Zhou, S.G. Sun, Y. Ding, Z.L. Wang, Science 326 (2007) 732-735. C.F. Wang, Y.C. Su, S.W. Kuo, et al., Angew. Chem. Int. Ed. 45 (2006) 2248-2251. S.J. Xu, Y.L. Luo, B.E. Tan, Macromol. Rapid. Commun. 49 (2013) 3925-3936.